U.S. 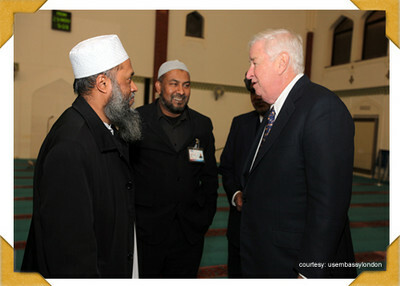 Ambassador Louis B. Susman greets officials at the East London Mosque Monday. Note: This story has been updated to add comment from the U.S. State Department. The U.S. ambassador to the United Kingdom visited and praised a well-known extremist mosque in London Monday, and invited its youth to participate in an embassy-funded initiative to travel to the United States. The East London Mosque(ELM) hosted recent speeches by al-Qaida in the Arabian Peninsula leader and now Specially Designated Global Terrorist Anwar al-Awlaki, a prominent leader of extremist group Jamaat-e-Islami Bangladesh, and a wide variety of other radical leaders. That's beside hate and terrorism promoted by the mosque's leaders and the Islamic Forum for Europe (IFE), a group headquartered in the mosque complex. U.S. ambassador Louis B. Susman went to ELM, which, in combination with the adjoined London Muslim Centre, holds more than 5,000 worshippers. During his visit, Susman said he had "great admiration" for the mosque and was "looking forward" to a dialogue with community members. He also invited young people from the community to enroll in the U.S. embassy's cultural and interfaith program, which coordinates trips for young leaders to the United States. ELM's long history of radical ties was the focus of a major documentary on Britain's Channel 4 in March. A cursory search on Google of the terms "East London Mosque Radical" generates multiple hits that show the mosque's radical connections. Recent reports have also appeared in major British papers such as the Independent and the Telegraph. According to Channel 4's documentary, "Dispatches: Britain's Islamic Republic," ELM hosted a wide variety of extremist speakers. Awlaki, who lives in Yemen, gave a talk by telephone as late as January 2009 at the ELM's London Mosque Center. He had spoken earlier in December 2003 at the London Mosque Center, telling listeners not to cooperate with British counterterrorism authorities. "A Muslim is a brother of a Muslim, he does not oppress him, he does not betray him and he does not hand him over... You don't hand over a Muslim to the enemies," he declared. On Thursday, a State Department official said Susman's visit to the ELM was among several mosque visits Susman made as "part of President Obama's call for a renewed dialogue with Muslim communities around the world." Susman toured the mosque and met privately with young members. The official did not address the ELM's connections with radicals. "The East London Mosque and London Muslim Centre have a large and diverse membership reflecting a wide range views" the official said in an email to the Investigative Project on Terrorism. "The Ambassador's visit offered an opportunity to share perspectives on the role of Islam in the United States, discuss U.S. foreign policy, and explore areas of disagreement and common ground." Mosque officials were told of concerns about Awlaki's activities and his ban from the United States before they included him in the Jan. 2, 2009, event. Much of those concerns were included in an article in the Telegraph. But published accounts and writings by mosque officials show their sympathies for Awlaki. On Nov. 5, 2008, IFE leader Azad Ali called Awlaki "one of my favorite speakers and scholars." On Nov. 19, Ali also wrote that by reading Awlaki's blog "one cannot help but feel his frustration at the constant denial of legitimate Islamic principles." By November 2008, Awlaki had already posted blog items about going to war with "the superpower" over now-convicted terrorist Aafia Siddiqui. On Nov. 5, 2008, Awlaki also posted an item telling Muslims that Jews and Christians want to force them to give up their religion, expressing support for Muslim fighters around the world and Khilafah, and "American culture will destroy their [American Muslim] families." Twelve days before his 2009 ELM speech, Awlaki wrote on his blog about correspondence he had with Somali terrorist organization, Al-Shabaab. On the post, he stated, "Al-Shabab not only have succeeded in expanding the areas that fall under their rule but they have succeeded in implementing the sharia and giving us a living example of how we as Muslims should proceed to change our situation. The ballot has failed us but the bullet has not." This had also been years after Awlaki's production of "Constants on the Path of Jihad" in 2005, a series that inspired numerous terror plots. Delwar Hossain Sayeedi, a senior leader of the Bangladeshi branch of Jamaat-e-Islami, was another speaker invited to the ELM. The Jamaat is a Pakistani-tied Islamist party which seeks to impose Sharia law in Bangladesh. Before his 2006 speech, Sayeedi had said that "England and America deserve all that is coming to them for turning a poor Muslim country [Afghanistan] upside down." Inviting a senior leader of Jamaat-e-Islami Bangladesh also fits in line with a British government assessment of the mosque, which called it "the key institution for the Bangladeshi wing of JI in the UK." The list of radical speakers at the mosque continues. Ghairat Baheer, a leader of Afghani rebels Hizb-i-Islami and spokesman for U.S. Specially Designated Terrorist Hekmatyar Gulbiddin, was invited in 2009. Bilal Philips, an unindicted coconspirator in the 1993 World Trade Center bombing and the teacher of convicted terrorist preacher Ali al-Timimi, was banned from entering the United States and Australia. However, he spoke at ELM in June 2009. Abdul Karim Hattin, a speaker who linked Adolf Hitler and President George W. Bush to the anti-Christ in a Toronto speech, played a game of "spot the fag" with a 2007 audience. The mosque has also featured anti-Semitic speakers, such as Sheikh Abdul Rahman al Sudais, a prominent Saudi cleric who has been noted for saying the "history of Jews is full of deception, trickery, rebellion, oppression, evil and corruption." He spoke there in 2004. Hussain Ye, who prayed for the Mujahideen of Iraq and Palestine, also stated that Jews celebrated the 9/11 attacks. Yet, he was still invited as a guest speaker at the mosque. So were anti-Jewish bigots Abdullah Daud, Azzam Timimi, and Haitham al Haddad. Imam Jahan Abdul Qayyum told mosque attendees in 2007 that "this Islam is the only Deen [religion] that Allah can accept." According to emails exchanged between British journalist Ted Jeory, Whitehall Editor of the Sunday Express, and the mosque's Media and Communications Officer, the Imam attended a Turkish event supporting Hamas and a Palestinian government that "will carry on with the jihad and Resistance against the occupier until the liberation of all Palestine." His name was also carried on a petition endorsing these ideas, although he claims to not have agreed to it appearing there. Muhammad Abdul Bari, the mosque's chairman, attempted to refute claims that Awlaki had been a radical before giving his speech at the mosque in 2009. Muhammad Abdul Aziz, an honorary trustee and former youth leader at the mosque, promoted UK government involvement with radical organizations on "a case by case basis," even when those groups may promote "a message of divisiveness, expressing intolerance towards other communities in the UK." Aziz's strategy was intended to provide a legitimate outlet for young extremists. He expressed these opinions as a paid ministerial advisor to the government's Communities Department. The mosque bookstore and IFE also provide radical literature to Islamic consumers, both by mosque organizations and outside writers. Books appearing in the store include Islamic Verdicts Volume 5, which calls for apostates to be beheaded and Fatawa Islamiyah Volume 6 , which tells readers they will be rewarded for stoning adulterers. Literature by the Islamic Forum of Europe, headquartered in the mosque's facilities, declares that it "strives for the establishment of a global society, the Khilafah [Caliphate]" which will be "comprised of individuals who live by the principles of the eternal code of life, the Shari'ah [Islamic Law]." The mosque isn't the only group that uses the organization's facilities to promote Islamism. The Islamic Forum for Europe (IFE) preaches a form of Islamism with strongly anti-democratic tones. IFE declared its wish to change the "very infrastructure of society, its institutions, its culture, its political order and its creed … from ignorance to Islam." It features books by radical Islamists like Sayyid Maududi, including Let Us Be Muslim, which undermine secular governments. A teacher in an IFE beginner's course was recorded in Channel 4's documentary, reinforcing such sentiments. "We can't say that, OK praying 5 times a day as a Muslim that's enough. No. We have to accept every aspect of Islam. Political aspect, economical aspect, cos [sic] Islam provides all the solutions," she said. "Allah gives us everything, the sharia covers everything, every aspect of life." Was he really banned? Is there a US source for this, rather than an almost certainly rogue claim from British media? Surely a ban on a US citizen would have been unconstitutional, and other sources have indicated the FBI wanted to get him back to the US for questioning. With a huge and constantly growing Muslim population, a nation cannot survive and remain free when that nation allows extremist mosques in its midst. It is almost as if the host nation is begging to be conquered. From its inception, totalitarian Islam has sought Muslim conquest of all nations. The US Ambassador praising the extremist mosque was US government support and approval of the preaching of violent jihad against non-Muslims. The message of US support for jihad was reinforced by inviting the mosque "youth to participate in an embassy-funded initiative to travel to the United States." The US showed Muslims that they desire Muslim conquest of America. The US is bankrupt with huge numbers out of work. Tent cities have sprung up all over America filled with jobless, homeless, desperate, neglected Americans. But for ruling elites, Muslims are the top favorites to lavish with money and lovely trips. US leaders have no interest whatsoever in working with moderate Muslims. The ONLY Muslim organizations that they will work with are Muslim organizations connected to the Muslim Brotherhood whose goal is Islamic conquest of America. So many made the ultimate sacrifice, giving their lives so that we could live in freedom and this is what our great nation has come to. Unless things change drastically, America's future as well as Britain's will be horrifying.